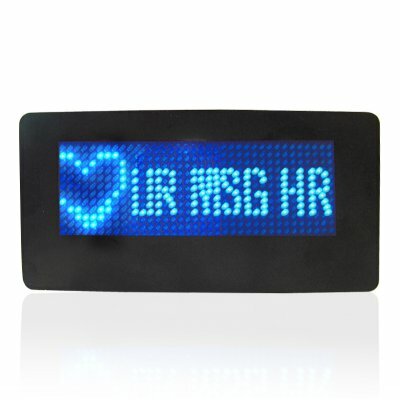 Successfully Added Cool Blue LED Nametag - Graphics + 5 Language Display to your Shopping Cart. Nametag with cool looking LED lights built in, perfect for displaying anything from names to graphics, and with 5 different writing types possible. This is a perfect idea for conventions or large business meetings, as with a click of a button, you can change between 5 different saved text messages or 3 images, making sharing the badge between co-workers fast and convenient. Finally, the nametag easily attaches with a magnet and plate in the back, so there are no worries about getting stuck with a pin. Cool looking and original, this LED name badge comes with an very low price for even a single order, but bulk orders will expand the savings even more..